This building was the result of a competition announced in 1935 to design accommodation for new government departments. The state had been using office space scattered all over the city, and a decision had been taken to centralise some of these offices in Kildare Street. 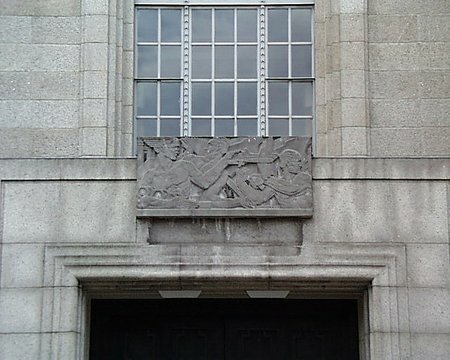 The competition was won in January 1936 by J.R. Boyd Barrett with this design – basically a stripped classical facade with an Art Deco entrance bay addition. Construction began in 1939 and was completed in 1942. The building has changed little since its construction and is a preserved example of 1930’s public building. 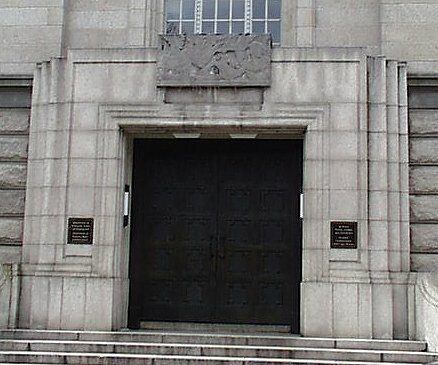 The exterior is robust and austere with the exception of the art deco relief sculptures by Gabriel Hayes. Barrett made attempts to ease the building into the streetscape although much bigger in mass than the surrounding buildings. By placing a cornice at the prevailing parapet level of the surrounding Georgian houses and a heavier cornice to mask out the uppermost floor, the building manages to have a relationship with the streetscape. Other than the cornices and sculptures, the main facade is a composed of a regular rhythm of window openings. The main emphasis of the facade is the entrance bay. This is placed at the Schoolhouse Lane corner of the building. A tall round headed window passes up through the floors with a stripped stone surround a a carved keystone representing Éire and including jazzy interstitial panels. On the Schoolhouse Lane side, the keystone represents St Brendan the Navigator. Both of the keystones had to be carved in-situ. The main entrance is sternly modern in design with heavy cast bronze gates weighing over 1.5 tons. The doorway has a carved lintel depicting the celtic god Lugh releasing aeroplanes into the air. 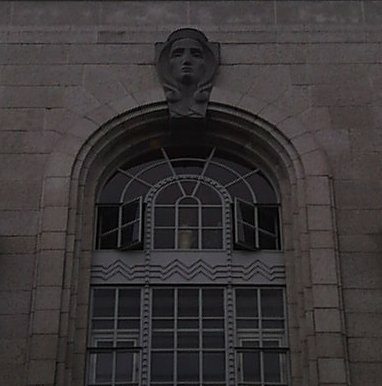 In addition to the keystones and door lintel, there are also relief carvings on the balcony of the ministerial office suite. These show stylised images of industry and commerce. Apart from this work, Hayes was also responsible for a panel on the College of Catering in Cathal Brugha Street called the Mhire Letios, and the designs for the 1p and 2p coins. The interior of the building remains as largely designed by Barrett – as a total piece of design. Everything from the ashtrays, fireplaces and door handles up was designed specifically for this building and all constructed during a period of war and material shortages. The interior with its polished woods and metals, stylised signage, patterned linoleum floors. The foyer for each floor was designed similarly with black and yellow art deco floor designs with symbols depicting each floor level in the center, deeply coffered ceilings and semi-circular information desks.